We are one of the leading manufacturers and exporters of high quality Mesotherapy Equipment. It is safe and non-surgical means of helping a man produce erections. The product is widely appreciated for its effectiveness and no side effects. It does not require medications, injections or surgery. We offer these at industry leading prices. The product is quality tested on varied parameters before delivery to the customers and are manufactured under the supervision of our expert professionals. Our firm is engaged in the manufacturing and supply of high quality Mesotherapy Machine. The machine is manufactured using latest techniques and methods evolved in the industry. It help infusion of the product deep into the dermal layer of the skin and uses ultrasonic vibrations at 300 million times per second. The ultrasound waveform stimulates the skin tissue and improves the permeability of the cell membrane which also improves collagen production. These are available to our clients at very reasonable rates and within the specified time frame. 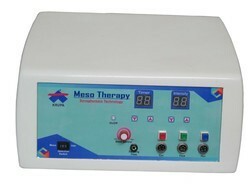 We are looking buyer of Mesotherapy Equipment from Gujarat. Most advanced technology for best result. LCD display with feather touch key pad.